Here is some more work Ive undertaken for the Beer Garden Co from bridport, dorset. This here is the most extensive of the garden builds for the Three cheers pub co. This particular pub the Avalon is in clapham on balham hill, And its a stunner! And then a small side garden made from reclaimed scaffolding boards, All hand cut to fit! I think anyone can agree they look great! They are great at what they do, Proper handmade wood gardens and furniture. If you need anything its well worth a call. In total I shot 5 pubs in london for them and then a few local ones will be covered soon. 4 of the pubs are owned by the Three cheers pub co (Link) , A lovely chain that have clearly put a lot of effort into making a bespoke and memorable chain. And now with some top quality beer gardens to match! 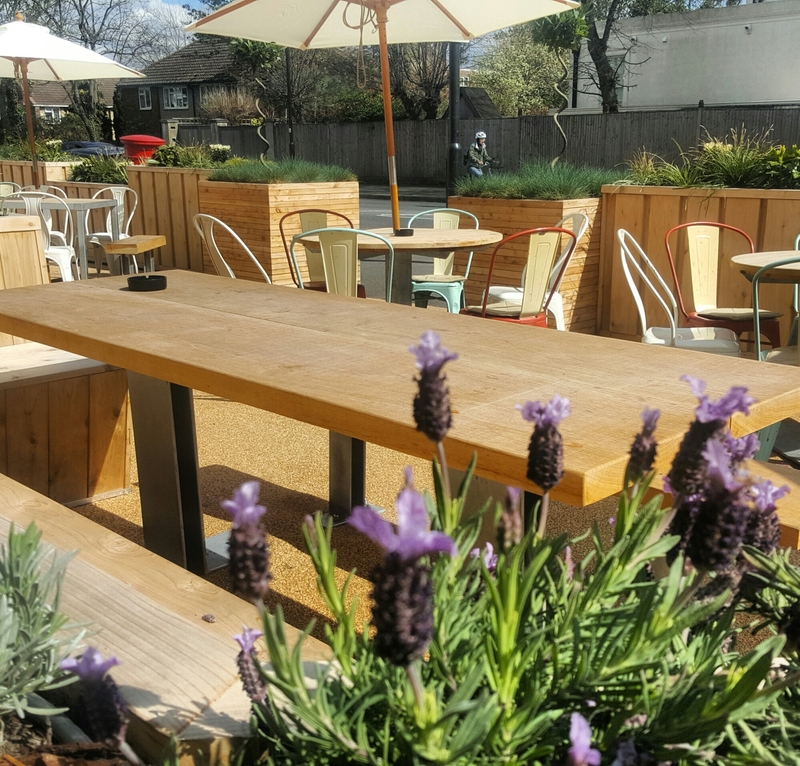 The whole construction of the garden looks great, a real testament to how much attention goes into the design from Ross and the guys at the beer garden co, And I seriously love those tables, they look and feel amazing in the flesh. This image here was shot while in london shooting beer gardens for a client. I had just finished shooting at the Fellow in Kings cross when walking back to the car and came across this scene, too good to miss I set up the tripod and shot just one frame. I love london at night and its one I still want to shoot properly, perhaps soon Ill be able to get out and fill up on city scenes. Yes its one of those posts! I know every wedding photographer in the world has written one, And seeing as we must make up 60% of the worlds population there’s a lot the same advice out there. I, however, am a bit different. I don’t go in for the hard sell, and I don’t have a million different tiered packages at varyingly complex pricing scales designed to make price comparison harder. I’m a simple guy and I like to know where I stand, and I’ve tried to reflect this into my work. So you need a photographer, and presumably you’ve asked on one of the Facebook groups, and had a hundred replies and 50 message requests. Mind Blown and still a little lost? It can be a minefield choosing a photographer, so here’s a handy guide to help you figure it all out. The age-old argument between budget and quality is one that still rages on and will always cause a few controversial comments on some posts. My advice here is to ignore all of these. Price often doesn’t matter. If you like the individual’s work and business then price will not be a major factor. However, contrary to popular belief lower priced photographers, will not necessarily completely ruin your wedding. Research is key here: new starters in the industry offer a great alternative for those who are looking to spend less than 1K and can still deliver great results. I know this from personal experience. There is enough room in the world for both styles of photographer to exist. Let me give a quick run though of what you would be looking for in any photographer, as these questions apply to all regardless of how much they charge. If your answer is yes to all of the following questions then you have your photographer. Are they insured? : Public liability and professional indemnity, is essential as it covers you in the case it all goes wrong. Check this and ask for documentary proof before booking. Back up Kit: Do they shoot with two cameras on the day? Do they carry any extra spare kit? This is important, as should any accidents or mechanical failures occur if they do not have spare equipment then they cannot continue. This includes flashguns, lenses, batteries, filters, chargers etc. Do they shoot on multiple cards or have dual card cameras? : I have both, but on the camera that only shoots one card I tend to use smaller capacity cards, allowing an insurance incase one goes missing or is corrupted.
. Do they provide a contract? : This is another must, as it should tell you everything you need to know about the photography arrangements on your special day. It needs to cover the following: deposit, payment terms, image usage rights, delivery times, and complaints. This needs to be signed by both parties. If they do not offer this or make an excuse, flee. They are likely to either be highly inexperienced or potentially dodgy. Can they show you full albums of work? : This will get you a feel of how they work through the day and how consistent the images are. Have they shot weddings before? : How long have they been working? How many have they shot? Are they new to the scene? Have they only ever second shot before? I wouldn’t suggest not considering photographers or people starting out as I’ve been there and its tough, but make sure you check their other work, ask the above questions and speak to them and get a feel for how they operate. Also make sure they’re not completely clueless. Can they cope with the long hours? : Weddings are brutal at times and can be an incredibly long day for a photographer, therefore being able to make sustain performance and concentration throughout is a must. I will say it’s not for everyone and some tend to struggle with the pace. Again fighting the case here for the younger generation, we offer the advantages that we can work for 14 hours a day easily and even sprint 200m to get ahead and shoot a good vantage point. I personally often find myself running about at weddings to get where I need quickly. Price: Admittedly price is always a factor for some, but please don’t be afraid of those starting out, or offering a lower priced day. We do still care about the work we produce, we still put in the same hours and we offer the same love and passion. In my opinion this is even more prevalent in those just starting out. I saw a comment the other day that said a cheaper photographer just won’t bother putting in the editing time for a couple of hundred quid, I always ask why not? I do! We care just as much and do just as good a job. So that’s my few points on choosing a photographer, there are many more questions out there, but they have all been done to death. My point here is don’t be put off by budget or new photographers, the only ones knocking these people down are the ones who were new 10 years ago and seem to have forgotten what its like to start with nothing. I love what I do, and I love the long days and pressure, its a massive buzz to be a part of someone’s day. I got into photography for the love of creating images, not the money. Yes you need to function as a business, but we’re artists at the end of the day and creating, in my mind, always comes first. In this post will be a list of suppliers who were present on the day too, and they were all great, especially the Pro Slot racing (giant scalectrix) which kept everyone entertained. Earlier last month I was in london, Shooting some amazing food at the Avalon Pub in Clapham. Its a wonderfull pub with a brand new beer garden, build by the Beer Garden Co in dorset. It is a great place to go to eat and have a drink. We set up a shoot on the long feasting table in the garden, with the view to shooting their new party/alfresco menu. With lots of smaller dishes and some colourful cocktails to shoot, I chose to stay away from some of the traditional aspects of food photography and shoot in a candid feel. This in my mind would add to the alfresco feel of the shoot. 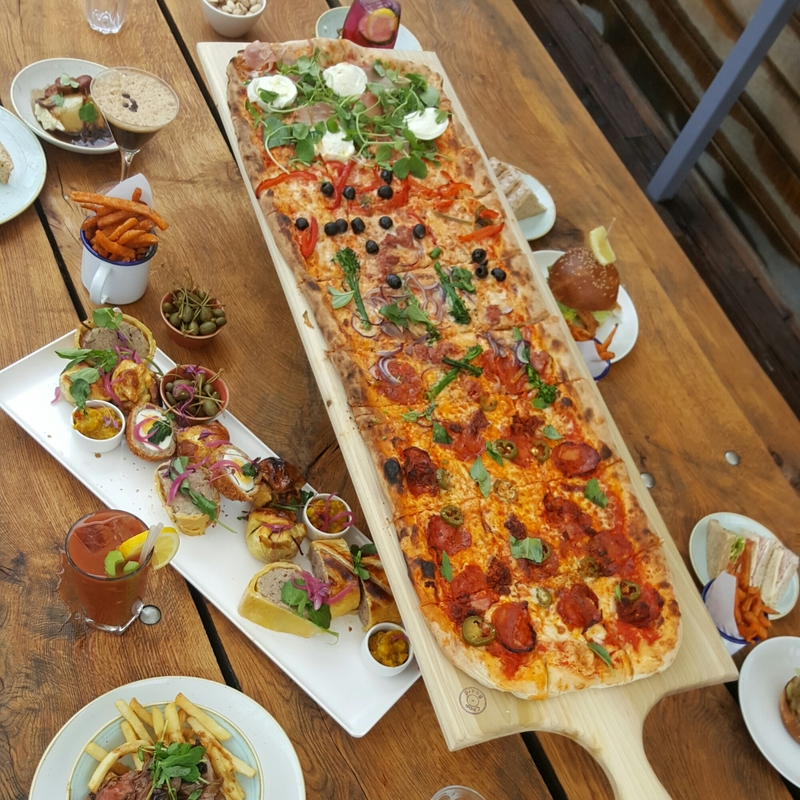 The feature piece of the shoot was their new 1 meter pizzas! yes 1 meter, They look very impressive and taste excellent too. Boards handmade by another Dorset company. All of these were shot with natural light, it was a over cast day anyway, but a large sail above the scene provided some lovely soft diffused light. there will be more from this shoot to share in the near future, As and when I get around to do it, but these two here are ones i favoured from the shoot. A little change to the blog.